Natalie, Lauren and Ashley's Blog: Happy 2-month Birthday! Today is Natalie's 2-month birthday. Time is passing so fast and she is growing so quickly. Natalie got her 2-month shots (2 needles!) at the doctors today (poor baby) but we also had the chance to weigh and measure her. She is now 12.10 pounds ... that's heavier than 80% other babies her age. And her head is 40cm around ... that's bigger than 90% other babies her age! Here is photo of her in her basket as a baby (taken 2 days after she was born) and contrast it with the photo taken this morning. 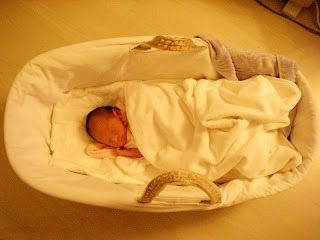 It's amazing, she has gained almost 50% of her birth weight in just 2 months. Go Beast! TV Junkie... caught in the act! Does this outfit make me look fat?